In contrast to that perception, I ended up being just on the borderline of bonking. Got all the symptoms of impending trip to Bonkistan. I backed off in time to avoid the worst of the symptoms, but there were a few touchy moments when I thought about to make yard biscuits. I recovery spun for about 10-minutes then hit it hard again. After that I felt great. Better than before. I even did some heavy-effort-low-cadence work for kicks. 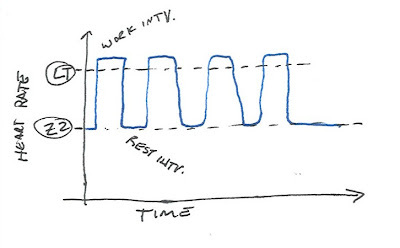 I've followed Friels' advice of the recovery intervals 2x as long as the work interval. For a 3-minute interval, do 6-minute rest interval. 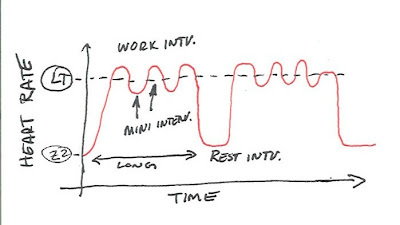 There are lots of places on a typical XC course you will see a 3-minute all out effort. But, where will you ever see 6-minutes of recovery in an XC race? Am I training in a weakness?